There was great news last week with the announcement that resource consent has been granted for the total flood lighting of Glover Park. Coupled with the renewal work at the ground, this will have significantly positive impact on our training. Work began early February by the contractors and they are making good progress on site, despite being hampered at times by dust conditions caused by the very dry weather. 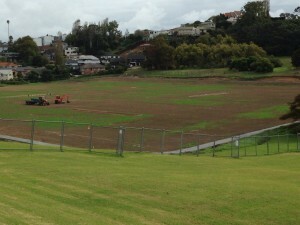 The recent rain has allowed work to continue this week. Significant gains have been made with the irrigation system now installed, but at this stage we do not have a connection to the water supply. The new footpath around the fields is about 80% complete and the main earthworks were completed some time ago. Horticulturists among you will be pleased to note that the kikuyu is regenerating nicely. The main and collector drains have been installed, and only the installation of slit drains and sand carpet remains to be completed, which should happen within the month, subject to weather conditions. Application for training lights has been approved subject to a number of conditions and the council will now go to tender for the installation of the lights in a few weeks’ time. There is (flood)light at the end of the tunnel thankfully. The sports fields will remain fenced off once the drainage and sand carpeting are complete to allow the grass cover to establish properly and mature. The soccer games that are usually played on this park over winter have been transferred to Pt England Reserve for the season. It’s with great pleasure that we can report all of the above and Eastern Suburbs will update you once we’ve got some finality around an official floodlit opening. Previous PostEastern Suburbs – El Salvador EditionNext PostModest, mild-mannered, and masterful between the sticks: Meet Ernest Wong, ESAFC Number 1.